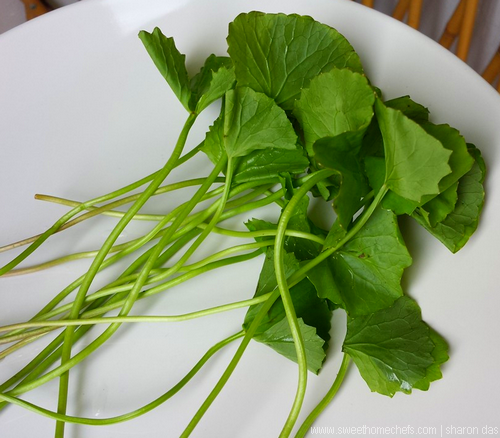 Daun Pegaga aka Centella, Gotu Kola or the Asiatic Pennywort is mostly eaten raw in Ulam, a Malaysian rice salad or cooked 'masak lemak' style, that is, in coconut milk gravy. It's also delicious in Urap, an Indonesian salad consisting of steamed vegetables mixed with seasoned grated coconut. I will try it this way one day. 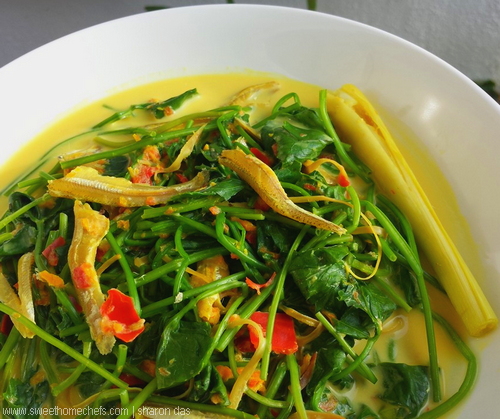 For now, I'm having my Daun Pegaga in a yummy coconut gravy with pounded fresh turmeric, strips of dried squid and anchovies. The aroma was tantalising and I felt an urge to eat it fresh out of the pan even before it touched the dinner table. Tsk, tsk! Below is a picture of Daun Pegaga. It is a little tougher than most greens I know and is mildly bitter-tasting but not unpleasant. I munched away quite happy with the flavour. 1) Heat milk and water in pan. Bring to a simmer, just below boiling point. 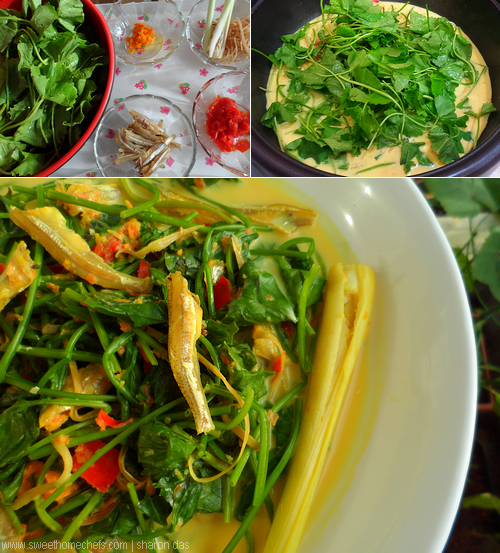 2) Then, add lemongrass, turmeric, chilli, dried anchovies and dried squid strips. Cook for a couple of minutes for the flavour to come together. Stir constantly and keep it from boiling. 3) Season with salt and sugar. 4) Finally, add in daun pegaga. Cook until done like you would any green leafy vegetable. 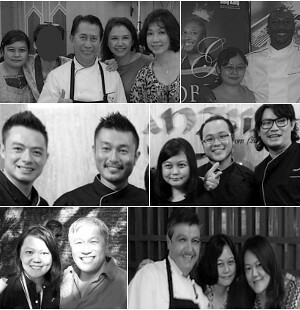 From top-left : Ingredients, Simmer All The Ingredients, Serve! So delicious, light yet very flvoursome! I love it, Sharon. I have never seen this green, let alone tasted it...is sure looks tasty, especially with all the flavors in it.